By Montagu Mail - In October 1994 when the Montagu Muscadel Festival Committee met to plan the next year's Muscadel Festival, the chairman, Oliver Deevoy came up with the suggestion that the new President of South Africa should be invited to open it. "Imagine the reaction from the rest of the committee! ", said David Parker, who served on the planning committee with Oliver. After first dismissing the 'highly unlikely' possibility, we thought there was no harm in trying. We wrote a letter and it was signed by Reggie Boesak who was the designated contact person. He made contact with the President's Office and it was not long after that, lo and behold, Madiba accepted. They were all absolutely astounded and overjoyed. Then the preparations started .... We were informed exactly what was expected of us. We had to explain the town layout in detail, the place a helicopter could land safely, the streets he was going to walk, the security climate. "I assure you it was nerve wracking", said Reggie Boesak. "I could not sleep properly!". "Please God", I prayed, "let everything go smoothly." The President's security team organised the logistics of the visit, cars were locally donated for the transportation of the party from and to the helipad at the hospital. 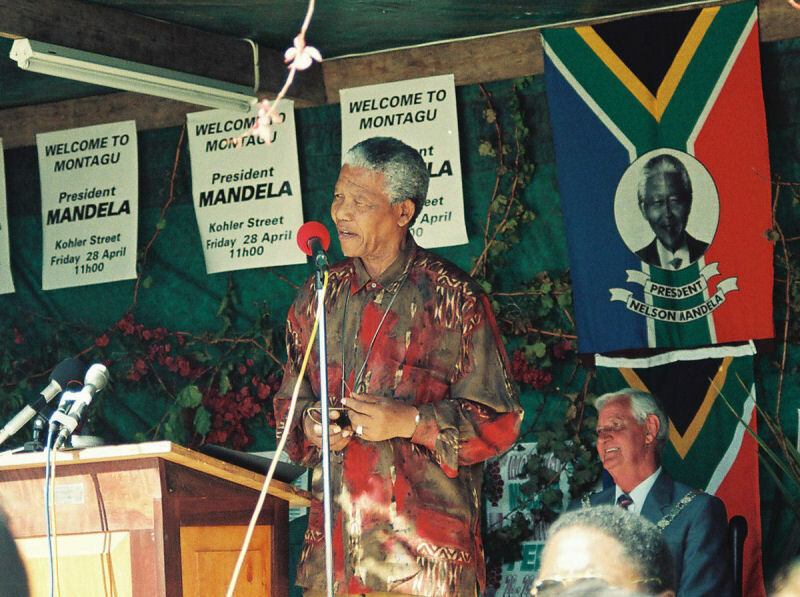 It was Madiba's very first non-political public function since his inauguration, and if Montagu was already on the map, coming here marked the town in extra bold letters. On the great day the sound of a helicopter overhead announced Madiba's arrival, but, on finding that the landing zone was at the local hospital, Madiba insisted on going to see all the hospital staff and patients. The invited guests at Kingna Lodge - where he was officially welcomed and afforded the opportunity to freshen up before addressing the Montagu Community - waited in suspense, wondering what had happened. On his arrival at Kingna Lodge his first action was to speak to the staff who were watching from the side of the lodge, only then did he go into the reception and the official part of the visit could begin. "It was here that I landed up in Madiba's company for an hour", says Reggie. "There he was, sitting in the lounge across from me, this great, wonderful man, with a faint smile on his face waiting for me to say something. I was dumbstruck, quivering inside and outside, my mind quite blank. Again I prayed 'Please God, put some words into my mouth!' Yet nothing came. So Madiba started talking. I remember precisely the content and his message though these may not have been his exact words. First he told me to relax! 'We are both men on even terms with one another,' he said. At which point I felt I could disappear into thin air. How could such a great man, President of our new Nation, be so humble? 'Reggie' I heard him saying so softly, kindly, as if we were friends, 'We should never forget the past but we should not dwell on the past. We are now a New Nation, everything is going to change. We all, from all walks of life, must join hands and make this nation work. Then he said "and as a leader I want you to take your community forward - Black, Coloured, White, Indian, does not matter. We need everyone's wisdom and talents to make this country a success. The first and most important issue now is to reconcile. To overcome the difficulties of the past and that would be your duty as a community leader. Apartheid had broken down communication between our people. It is now my task, as well as yours, to teach our people to respect one another, respect our different cultures, languages, and ways of living. As from today, I want you to help accept responsibility. Together we can make a success of the new South Africa that belongs to everyone who lives in it." "When it was my turn to be introduced to Madiba", said Dieter Sowade, the then owner of the Avalon Springs Hotel, "I shook his hand and having brought a hard cover copy of his Long Walk To Freedom, I asked him if he would be so kind to sign the book for me". He looked at me for a moment and then said : "You mean to say you actually read this nonsense?" "Of course", I spluttered, caught a little off guard, to which he replied: "Don't waste too much time on the past and rather concentrate on the future"......... while he dedicated the book to me. "Madiba to the bone!" The organisers of the Muscadel Festival at the time were Oliver Deevoy, Aden Grieves, Reggie Boesak, Lee Riding, Marriette Barnes, Gunther Leidig, Dieter Sowade and David Parker.